We are dedicated to creating and supporting regenerative local food systems. Through community engagement, education and project-based assistance, we intend on empowering low-income communities and creating equitable, affordable food access throughout Arizona. Increase food security in low income communities and mitigate food deserts by creating and supporting projects that provide low-income communities with equitable, affordable, convenient access to healthy foods. The Food Tech For the Future: Growing Digital Farmers Project will introduce students, teachers, volunteers and the community to the world of food computers. The innovative nature of this project will inspire local engagement from tech industries, and also global support from giants like Google. This project will be highly interactive and students will have the chance to build their own food computer, conduct plant growth experiments, share the data globally and learn about biology, genetics, technology and robotics through first-hand experience. Students will continue studying food technology in college and continue on to ensure that global food needs are being met. This project is meant to educate, engage, and inspire young adults into thinking critically about sustainability issues and creating solutions based on well founded science, research and technology. This project aims to strengthen our local food community through farm support. We will not only be providing support to farms in the form of labor, but we will also be providing an experience to volunteers, who will be able to learn about the farms, food, and the process it takes to grow it. We hope that we can engage people from our community to take part in the program and learn more about their local food system. By connecting our community with local farms, and teaching people more about what it takes to grow food, we hope we can create a greater perceived value of locally grown food among our volunteers. This will ideally inspire volunteers to source more of their produce from local farms, in support of all the work that they do. 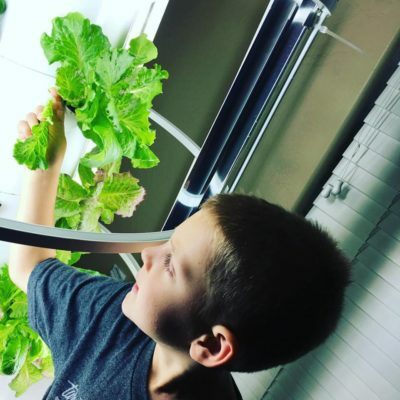 This project aims to increase food education and security in Fowler Elementary School District (FESD) through the use of vertical, aeroponic Tower Gardens. 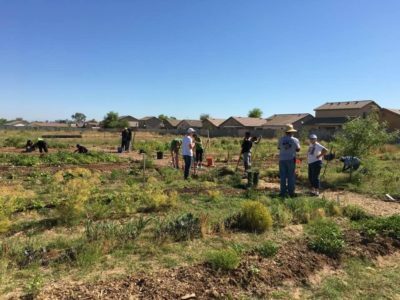 The proposed project would create and support a food growing curriculum throughout an entire school district located predominantly within Maricopa County food deserts, thereby also strengthening food access for the students and teachers. The aim of this project is to teach kids how to grow food through alternative gardening methods, to create the space and access for students to experiment with growing and eating nutritious food, and to provide the schools with a source of fresh produce for students, staff, and family. The intention of this project is to abolish food deserts, reduce food waste and connect people with healthy, local food. Citizens of low-income communities, that reside within food deserts, must travel much farther than the average consumer for their groceries; yet, they lack many of the resources that the average consumer typically has. Finding fresh produce can be both a financial, and spatial burden for these communities. Many farmers markets and grocery stores have embraced The Double-Up Food Bucks program, yet for some people, that is just not enough incentive to travel by bike or bus in the Phoenix heat. We propose that healthy food should be delivered to these low-income, low-access communities, at a convenient transit location located within or near their neighborhood. If you have ever been at a farmers market near the end of the day, or have been a vendor at one, then you know how much excess food there is. Vendors often give away or donate excess produce because they simply don’t have an outlet to distribute it before it goes bad. We would like to partner with these vendors, specifically, but not limited to, Community Exchange, and take the excess produce that they don’t sell by the end of the day and redistribute it to the low-access communities at a greatly discounted price. In exchange, we will lend the vendors our refrigerated truck to help keep their produce fresh throughout the day. We also plan to be included in Farmers Markets On Demand, a local online platform to advertise farmers market products. From there, consumers can see what produce is available throughout the day, and place orders based on availability. This service will also be providing free advertising to the vendors. At the end of the day we will transport the produce from the original farmers market to pop-up market locations near public transportation stations within food deserts. These locations will be advertised to the community in advance, and there, they can pick up pre-placed online orders, or shop whatever produce is still available. The pop-up markets will accept SNAP EBT, WIC, Senior Nutrition Assistance, and Double Up Food Bucks to ensure that all consumers have access to this resource. The pop-up nature of the market will allow us to reach multiple locations within a day, thereby maximizing the effect of our efforts. Food deserts are defined by the USDA as being low-income neighborhoods that lack access to affordable produce. There are a staggering number of these food deserts that exist within our county. This is not only a matter of sustainability, but also of social justice. Access to healthy food should not be dependent on your income or zip code. We hope to create a compelling media piece to inspire our community to create change and help abolish food deserts in Maricopa County. Our goal is to share the perspective of the communities that food deserts impact first-hand through a video or possibly short documentary, as well as an informational pamphlet to share at tabling events. Historically, major issues such as these have been conquered when passionate people join together to create revolutionary change. The goal of this media piece is to not only shed light on this very prevalent, local issue, but also to inspire people to help us to conquer it, and revolutionize our system to ensure that healthy food is accessible and affordable to all. with a local refugee assistance organization, AZSA supplied a garden to two local refugee families in need of food assistance. The food in the gardens was chosen by the families to help provide for their individual family food needs. This garden was funded by FIGG Community Gardens. Two first-grade classes helped us set up and install the gardens, creating food education and access for over sixty students. Funded by The City of Tempe, this garden also supports a first-grade class in Tempe. Our first two classroom gardens convinced us of the value of Tower Gardens as an educational tool and source of fresh, healthy food for students. Engrained in Memorial Union at Arizona State University- AZSA assisted this sustainability-focused restaurant in securing ten tower gardens for the patio of their restaurant. These gardens not only provide fresh food access to local college students, but also promotes the concept of urban agriculture and food sovereignty. We are developing an intervention to help students who express an interest in meat reduction to plan, implement, and maintain their goals.